Let’s face it, studying the Bible on its own can be quite a boring ordeal for small kids. This is where the Sunday schools come in. They come up with better ideas that make learning the Bible fun for kids. Small games or mental exercises are used to teach the different verses of the Bible. In addition to that, these games also provide a ground for spiritual enlightenment for these children. So, if you are looking to incorporate Bible learning in your child’s curriculum, then these games provide a quick and easy gateway. What are these games? Let’s have a look. This is the most basic form of game that you can play with kids in a Sunday school. It does not require any additional props, but works fine with just a Bible. The premise of this game includes reciting a passage from the Bible, followed by quick repetitions. Then the kids are asked to repeat the same verse among them. This continues till every child has had their turn. This is yet another variation or continuation of the previous game. In this case, you will need a black board and some chalks. After memorizing a particular verse, write it down on the black board. 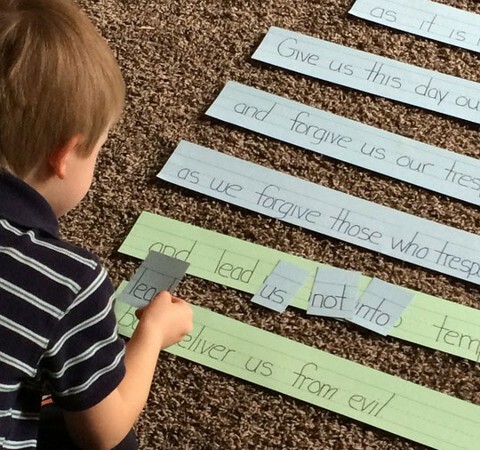 After that, each child is asked to erase one word from the verse and then repeat the verse in full. Keep doing it with other children till the whole verse is erased from the board and the children have completely memorized it. This is a simple yet effective variation of “Finding the Treasure” that can be used to teach children different Bible verses. After memorizing a particular verse by heart, ask the kids to write down a single word from the verse on a small piece of paper. Collect all pieces and hide them around various places in the classroom. Ask the children to find those on their own and lay out the verse in the correct order. Recite the complete verse after arranging the verses properly. This is a bit of a competitive game that can be played among kids. At first, open the Bible and choose a random verse or passage from it. Provide a small reference of the verse to the students and ask them to find the verse as quickly as they can. The first student who finds the correct verse gets a single point. The first person with 5 points gets to win the game. You can play this with multiple teams of kids as well. This game is a bit elaborate in its nature and is played to impart the omnipresent nature of God. Ask each student to bring one of their close possessions to Sunday school. Now collect all those possessions and ask each student to come up with a connection between God and their possession, for example hoverboards. They can also connect a Biblical verse to their object. This game requires the involvement of students to a much greater extent than the previous games. Ask students to prepare a list of questions based on their Bible lessons. Divide the class into 2 teams, and each team gets a bell. Ask them to ring the bell when they know the answer to the questions. Each correct answer yields 1 point. The team with the most points wins at the end of the game. This is a very common alphabet game that is played quite frequently with students who are somewhat adept in their Bible lessons. The teacher starts off the game by reciting a verse from the Bible which includes the alphabet A. After that, the students have to come up with separate Bible verses, starting from the alphabet B, all the way to Z. Switch up the names of places and people in the Bible to finish this game. Having a healthy environment always helps children to learn the verses more quickly and efficiently. Playing these games has had a positive effect among kids, and they learn about core Christian values such as cooperation and unity from these games. This is a nice and subtle way to indoctrinate your kid from an early age. Thus, these games are certainly an effective tool to impart the knowledge and wisdom of the Bible to young children in a fun and engaging way. Emily has always had an intense passion for exotic foods and sweets. She is also a blogger at TheElectricWheels.com and has traveled various places in search of tasty candies and delicious treats.